"As with his weekly column, James Montier's Value Investing is a must read for all students of the financial markets. In short order, Montier shreds the 'efficient market hypothesis', elucidates the pertinence of behavioral finance, and explains the crucial difference between investment process and investment outcomes. Montier makes his arguments with clear insight and spirited good humor, and then backs them up with cold hard facts. Buy this book for yourself, and for anyone you know who cares about their capital!" The seductive elegance of classical finance theory is powerful, yet value investing requires that we reject both the precepts of modern portfolio theory (MPT) and pretty much all of its tools and techniques. In this important new book, the highly respected and controversial value investor and behavioural analyst, James Montier explains how value investing is the only tried and tested method of delivering sustainable long-term returns. James shows you why everything you learnt at business school is wrong; how to think properly about valuation and risk; how to avoid the dangers of growth investing; how to be a contrarian; how to short stocks; how to avoid value traps; how to hedge ignorance using cheap insurance. Crucially he also gives real time examples of the principles outlined in the context of the 2008/09 financial crisis. In this book James shares his tried and tested techniques and provides the latest and most cutting edge tools you will need to deploy the value approach successfully. 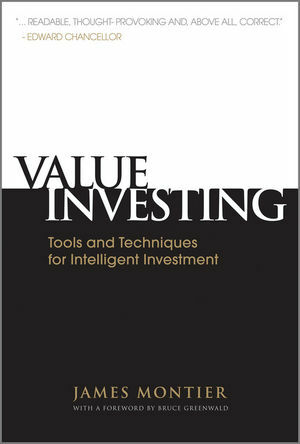 It provides you with the tools to start thinking in a different fashion about the way in which you invest, introducing the ways of over-riding the emotional distractions that will bedevil the pursuit of a value approach and ultimately think and act differently from the herd. James Montier is a member of GMO's asset allocation team. Prior to that he was global strategist for Société Générale and Dresdner Kleinwort. He has been the top rated strategist in the annual extel survey for most of the last decade. He is also the author of three other books – Behavioural Finance (2000, Wiley), Behavioural Investing (2007, Wiley) and The Little Book of Behavioral Investing (Forthcoming, Wiley). James is a regular speaker at both academic and practitioner conferences, and is regarded as the leading authority on applying behavioural finance to investment. He is a visiting fellow at the University of Durham and a fellow of the Royal Society of Arts. He has been described as a maverick, an iconoclast, an enfant terrible by the press.